Up to five spectators think of cards from a shuffled deck - immediately all five cards are revealed and the deck can be examined! Includes 3 bonus routines in which the spectators locate their own mentally selected cards! This uses an excellent principal and it's surprisingly easy to do. 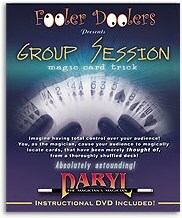 Includes instructional DVD - featuring live and studio performances by Daryl -The Magician's Magician.